New England Patriots will not appeal against the $1m (£642,000) fine and draft-pick punishment handed out by the NFL over the 'deflate-gate' scandal. A report ruled Patriots staff deflated match balls in January's 45-7 play-off victory over Indianapolis Colts which sent them to the Super Bowl. Owner Robert Kraft said he wanted to take the issue "off the agenda" at a news conference on Tuesday. Quarterback Tom Brady is still appealing against his four-game ban. Brady was found to be "at least generally aware" of a scheme to under-inflate 11 of the 12 game balls for the rain-affected match, giving Brady more grip in the cold and wet conditions. "Patriot fans are going to be disappointed but taking this off the agenda will be the best thing," said Kraft. "I don't want to continue the rhetoric that's gone on for the last four months." 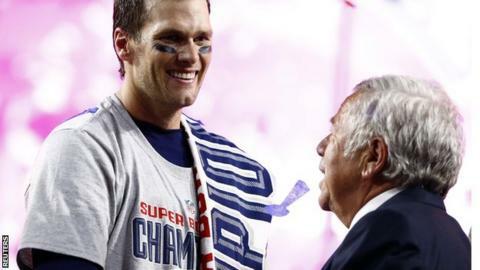 The Patriots owner previously said the punishment as "far exceeded any reasonable expectation".